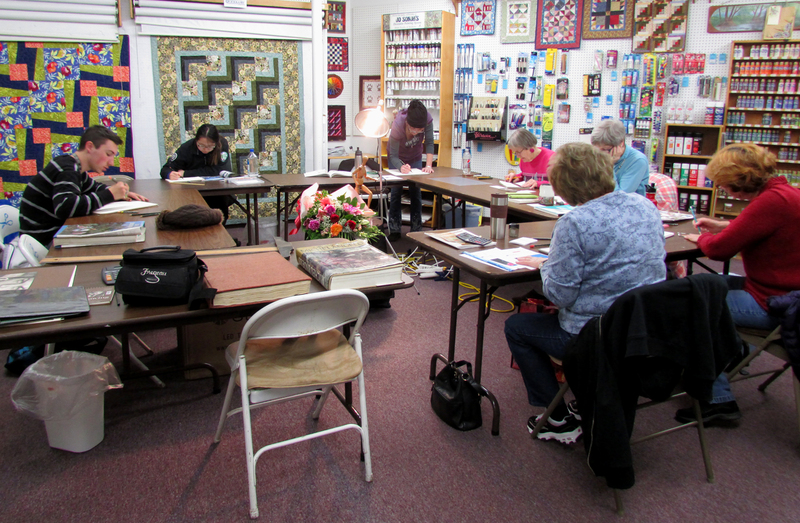 The Fortuna Drawing Class works on individual projects while enjoying the company of each other. On the last evening of my last Drawing Class we talked about having the attitude of a life-long learner. Yes, with each day I am still learning in so many areas! Having the attitude of a learner takes a lot of the pressure off those of us who can be too hard on ourselves and our artwork, trying to compete in a world that is hyper-visual. Images are everywhere, but there is great value in learning to create images the old-fashioned, time-honored way – with a pencil and paper. Don’t get me wrong, I like all kinds of artwork, “hand-made” and “digital.” I do them both! But the learning curve with that simple pencil and paper trains the brain in a very significant way. There are no techniques, ‘happy accidents’ or special effects to divert our attention…it is simply practice and learning…practice and learning…discipline, practice and learning! Having the attitude of a learner means that when an artistic idea or experiment doesn’t pan out, I don’t get bummed. I learn what not to do. Or I learn how to refine a process or change something or “go back to the drawing board.” Hey, what an appropriate cliché made more meaningful! When we think about life and consider ourselves life long learners, we can acknowledge that “God is God and I am not”, and I am just here to learn what He wants me to do as He supplies the purpose and direction in my life. If I am a learner than all of life is a classroom and I can anticipate each day with a hopeful expectation. I am still learning! ← First Friday in Fortuna!